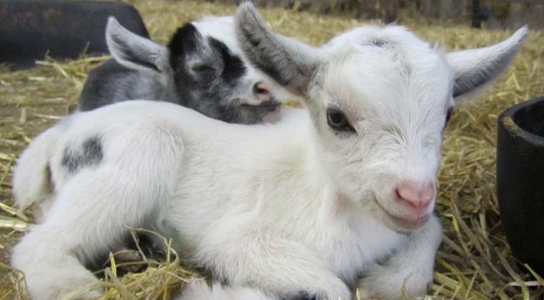 Pygmy goats have become one of the most popular staples of hobby farms around the country over the last 30 years. These wonderful little critters make great pets and provide a vast variety of contributions to any farm they inhabit. In addition to having fun and adventurous companions, raising pygmy goats will give you the added benefit of having an easy milker, a hardy climate survivor, and a very effective weed eater! However, before jumping into the this world head first and pulling over at the first road-side sign you see that says “Baby Pygmy Goats For Sale”, you need to learn a little more about the breed so you can accurately determine if they will make a good addition to your family. Pygmies can be wonderful in the right environment, but can be a nuisance if you are unprepared of ill-equipped to deal with them and their lifestyles. What do Pygmy Goats Eat? When a baby pygmy goat is born (also know as a Kid), their stomachs aren’t able to digest roughage the same way that an older goat can. It can take a couple of months for the rumen in their stomachs to fully develop, so for the first 8-10 weeks they survive almost solely on their mothers milk. As they start to grow they will naturally start to eat a few leaves and grasses here and there, which will kick start the rumen in their stomachs and by the 10 week mark most will be ready to start on a full-time diet of roughage and grains. Goats are great grazes and foragers, in fact there is a growing industry of goat “lawn mowers” – Farmers who are hired to have their goats come in and clear out rough terrain. Goats will eat about anything their mouth can reach, and they have incredible stomachs that can digest even the toughest of roughage. Be sure not to leave your gloves or hat within reach of your Pygmys though! Or you will find that they have disappeared down their throats! Since you will be raising pygmy goats it’s important to remember that they are smaller than most other goat breeds and therefore won’t need quite as much food. Still, you will need to supplement their diets with hay, alfalfa, and grains (corn or oats) especially during the winter months when natural food sources are harder to find. The two most important vitamins that a Pygmy goat needs are Vitamin A and D. Vitamin A helps keep their stomach linings and skin in good working order and can be supplied through quality leafy hay and yellow corn. Vitamin D is extremely important for their bone structure and will keep their bones strong. Vitamin D can be supplied by the sun during the summer months, but if the winter is long and dark then you will need to supplement their Vitamin D supply with sun treated hay. This is hay that has been cured by the sun, rather than by heat. 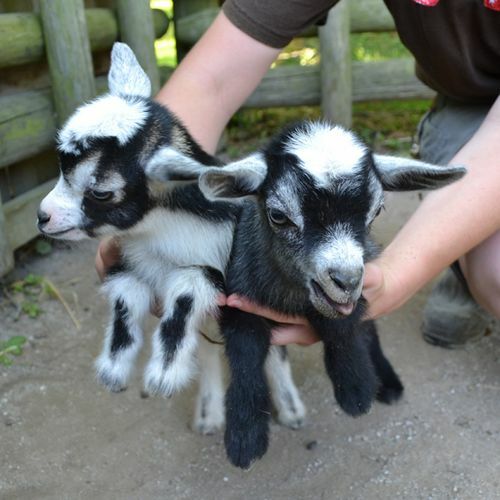 How Much Are Pygmy Goats? Getting into the pygmy goat game doesn’t have to cost an arm and a leg, and with a few hundred dollars and a few acres of land, you can soon have your own small herd of Pygmys. One of the most common questions new hobby farmers ask is “How much are Pygmy Goats” and the answer varies from place to place and goat to goat. Usually cheaper than more traditional milking goats such as the LaMancha, you can find Pygmy goats for relatively cheap. Since there are very few livestock auctions that still allow the sale of goats, most buying and selling is done face-to-face which means that the price you pay will depend greatly on who you are dealing with and where you live. In general you can buy a Pygmy goat with no papers for as little as $50-$75, and it’s not uncommon for someone to want to sell a group for even less per head. However, if you are looking for a high quality show goat or a goat with documentation showing their lineage and registration papers then you could pay $500-$1,000 or more! It all just depends on what type of a goat you are interested in and how much you are looking to pay. One of the best ways to find out where to buy pygmy goats is to ask around with local farmers who have goats. Often times goat people stay in close touch and if someone is looking to sell they will usually let their friends and neighbors know first. This can also be one of the best ways to get a good deal, since you know they are looking to sell and might be willing to part ways with their goats for a low price. If you see anyone advertising “Miniature Pygmy Goats For Sale”, that is a good indication that they are breeding their goats to sell them, and the prices will have less negotiating room. Pygmy goats ARE miniature, so anyone advertising “Miniature” is looking to capitalize on the “cute factor” and make a profit. Another great place to find a pygmy goat for sale is online at Hoobly Classifieds, they usually have quite a few listings for goats at a wide range of prices. It can be “hit or miss” as to if they are in your area or not, but it’s a great place to look. If you are looking for baby pygmy goats for sale, you should definitely check out the breeder listings at GoatFinder.com. They have a pretty large group of goat breeders listed on their site, and have at least one in most states. So the chances you find one near you are pretty good. If you are interested in becoming a Pygmy Goat owner, then know that you are getting a wonderful pet and a great addition to any hobby farm. Be sure to research more information on the breed at national Pygmy Goat association website http://www.npga-pygmy.com/ They have a wealth of detailed information that can be a huge help to you as you consider buying your first pygmy goat!